After Tennessee dominated Kentucky on Saturday afternoon, they’ve moved back to a projected No. 1 seed in Jerry Palm’s latest bracketology update. Palm does NCAA Tournament projections for CBS Sports, and he posted on Saturday night that No. 7 Tennessee’s (26-3, 14-2 SEC) 71-52 victory over No. 4 Kentucky (24-5, 13-3 SEC) did enough to move the Vols back up to a projected No. 1 seed and drop the Wildcats back down to a No. 2 seed. According to Palm, Tennessee’s victory over Kentucky gives the Vols eight wins over “Quadrant 1” teams this season. Prior to the 2017-18 season, the NCAA Selection Committee introduced a quadrant system to grade victories along with the RPI rating system. Now, the selection committee uses the new NET rating system to evaluate teams, but bracketologists and college basketball analysts still use the quadrant system to determine the quality of wins. A Quadrant 1 game is one that’s played at home against a team ranked between 1-30 in the RPI, on a neutral court against a team ranked between 1-50 in the RPI, or on the road against a team ranked between 1-75 in the RPI. 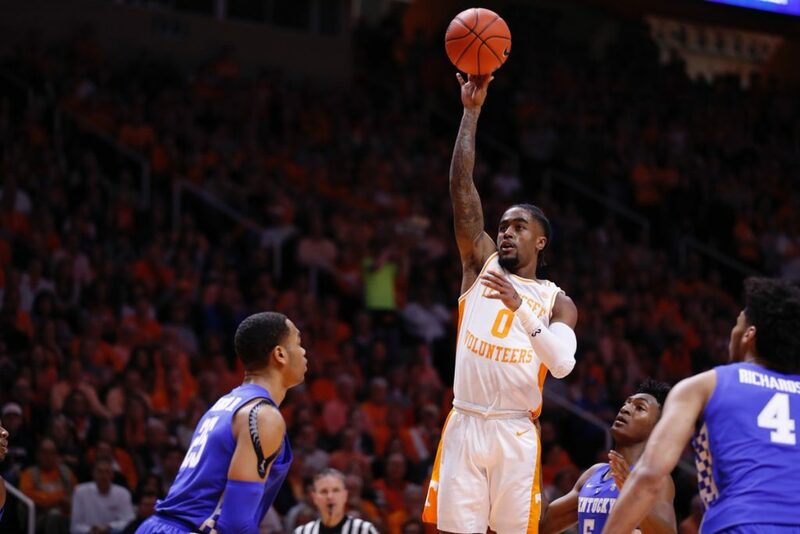 The Vols have defeated eight teams that fit that description, and they’ve picked up back-to-back victories over Quadrant 1 teams with wins over Ole Miss on the road and Saturday’s beat down of Kentucky. The Vols are now 8-3 vs. Quadrant 1 teams, and they’re a combined 17-0 against teams in Quadrants 2-4. Palm’s complete NCAA Tournament bracket update will be posted on Sunday on CBS Sports’ website. The Vols will be a projected one-seed in his new bracketology update along with Duke, Virginia, and Gonzaga. Tennessee’s men’s basketball team has never been a No. 1 seed in the NCAA Tournament. The Vols have twice earned a No. 2 seed, and they were a three-seed for the first time in last year’s tournament. The victory over Kentucky on Saturday ensured that the Vols stayed tied atop the SEC regular season standings with LSU, too. The Tigers survived Alabama’s upset bid in Tuscaloosa on Saturday, outlasting the Tide 74-69. Both teams are 14-2 in SEC play, but LSU owns a head-to-head tiebreaker over the Vols for the No. 1 seed in the SEC Tournament. Last year, Tennessee finished tied with Auburn for the best conference record at the end of the regular season. Both the Vols and Tigers split the regular season title, but Auburn got the top overall seed in the SEC Tournament because they won their head-to-head match-up with the Vols during the season. Tennessee has never won at least a share of the SEC regular season title in back-to-back years in school history.